A few days back I shot an email off to Nokia CEO Stephen Elop trying to explain how I, a long time, loyal and mostly happy customer, feel about the seeming lack of support for those of us who chose Nokia when it launched devices on the Windows Phone 7.x platform. I am a happy owner of a Nokia Lumia 800, but off late it has seemed that Nokia’s enthusiasm for the older platform has been on the wane especially when it comes to app support. New apps have been consistently coming to the Nokia collection but few of them target the older platform. Some of these are apps which can easily be supported on the older platform. An example is the Nokia Video Upload app. Even the excellent mapping platform hasn’t received the fresh coat of pain that it should have received after being rebranded as HERE maps. I also mentioned about a well known camera issue specific to the Lumia 800 device. I was surprised to get a reply from Stephen Elop and was delighted by the promptness of it. Things began to roll after that and Nokia India representatives got in touch. They were careful to make note of my feedback and I am waiting for them to come back to me with their response. 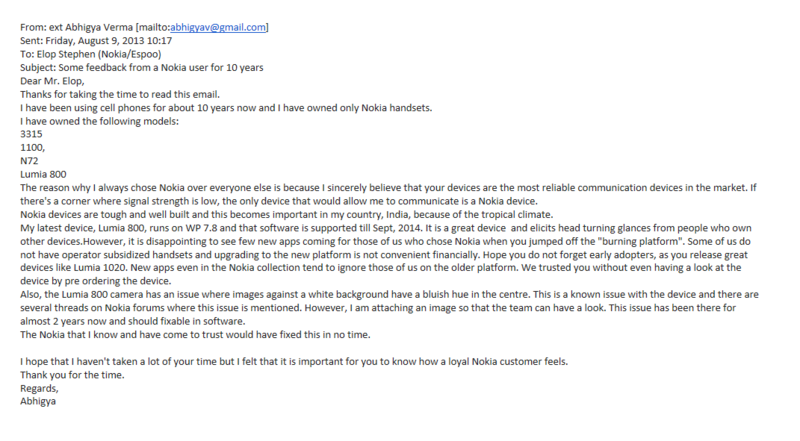 So far, I have been happy with response I have got from Nokia. I expected them to deflect the partially towards Microsoft but, to my surprise and delight, the representatives I spoke to seemed to take ownership of the user experience that their devices provide even if they don’t own the platform. Overall , the communication so far has left a positive impression on me about how Nokia listens to us customers and how far it is willing to go to allay concerns and be sensitive to our pain points. I believe that’s a step in the right direction for a company that is seeking to regain lost ground in the smartphone arena. PS: I will update this post as when I receive further responses from Nokia. I received a call from Nokia today (on the day it was announced that Microsoft was buying the Devices and Services business of Nokia) and the representative assured me that the feedback I had provided would be discussed within the organization and she would get back to me if they had any news for me. The conversation just re-enforced the impression that Nokia is willing to listen to it’s customers. And as Nokia and Nokians embark on a new future, they have my best wishes! Nokia is wonderful cellular brand ! Getting good support from Nokia customer care is expected and commendable . I recently encountered horrible experience at Samsung service Centre sec 27, Noida. Seriously, they made me bristle with anger.